A few weeks ago, we did a swimsuit fashion show. Perfections Salon did the hair and makeup for all the models. My event planner, Libby Hodapp, said something to the stylist (Sarah Caudill) about the models’ hair holding up so well to the heat and humidity. Which was surprising because it seriously felt like it was 200 degrees that day and the humidity was so thick it was tough to breathe! Turns out Sarah did keratin treatments on a lot of the models’ hair, which is why their lovely locks were behaving so well. One of the models in particular, Maria Swafford, had the keratin service done on her extremely curly, coarse and frizzy hair. Maria vouched for the treatment and told Libby that the treatment changed her life. Libby really worked hard on that swimsuit fashion show, and hinted to me that she was curious to try out this keratin treatment … which, who knew, had life-changing potential! haha! Sooooo… what’s a boss to do? Of course, I treated her to her first treatment! I love love love her new haircut! Libby was a little freaked out that he took off so much, but I think it frames her face well and looks polished and professional. After that, Sarah washed Libby’s hair with clarifying shampoo to remove any product/chemical build-up. 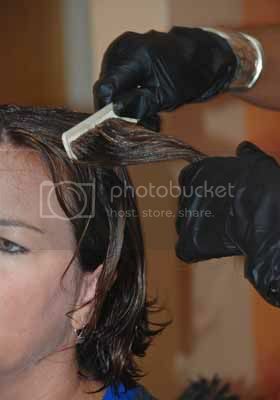 Then she applied the keratin smoothing treatment. I learned a lot about keratin in this process. I thought this was interesting… Since the product is not a chemical, there aren’t timing or over-processing concerns (being a brunette-gone-blonde, I know oh too much about over-processing!). When they put it on hair, it adds strength, elasticity and moisture back into dried up and frizzy hair. The smaller keratin molecules get inside the hair and work from the inside out. The larger molecules coat the hair, preventing damage from environmental bad guys like UV rays/water/heat. My dad is a science teacher… he’ll be so proud that I just talked about molecules! haha! Ok, enough science talk. Next step was to blow dry Libby’s hair to about 70%. Then, Sarah started a flat-ironing process. They had a special flat iron designed specifically for keratin treatments, and that sealed the treatment into the hair. And voila! Libby had beautiful, smooth, soft, sleek and shiny hair! After a week, I asked Libby how things were holding up. She said it’s awesome. Her blow-dry time was cut in half, and she barely, if ever, needs to use a straightening iron now. The only bad thing is that was wasn’t allowed to wash or wet her hair for 72 hours after the service, and she had planned to be at the pool with her kids that entire weekend. So, keep that in mind if you do get this treatment… block your schedule for a few days. You can’t get in pools, or wet your hair in showers for a few days. But she said it was worth it to have more manageable hair. She works full time – and has a baby and a toddler – so every saved second counts! As a bystander, I can tell you that her hair doesn’t look dry or coarse. It looks really shiny and healthy. I keep waiting for her to do that Pantene hair swish every time she walks by now. haha! I hope this gives you a little insight into a keratin treatment! Perfections Salon is actually a client of ours at Cincy Chic, so I’m sure they’d love for you to call them (513.984.2555) if you want to get a keratin treatment for yourself. But no matter where you go, remember to ask about those ingredients I mentioned so it’s a happy and healthy keratin experience! And ask about the down-time too, I hear that can vary. Feel free to email me at astorer at cincychic dot com and tell me about your keratin experience where ever you go. I’d be interested to hear how other people like it! *After I posted this, I got a question from a friend asking how long it lasts. According to this site, it softens curls/waves for up to three months, and keeps it conditioned for about six months. Sneak Peek: Swimsuit Fashion Show featuring Ben-Gals! My team and I are suuuuuuuuuper excited for this Friday. We’re putting together a swimsuit fashion show featuring the BenGal cheerleaders and the NYC-based couture swimsuit line, Cala Ossidiana. Today, when the girls came to the office for their fitting, I snapped a couple pics to give you a sneak peek of the fab fashion we’ll be featuring at this special show. Here are all the details and the pictures are below. I hope you can make it! Make a splash with this fashion show featuring Cincinnati Ben-Gal Cheerleaders and the hottest swimwear trends from NYC-based designer Cala Ossidiana. Also enjoy shopping and product sampling with Votre Vu with Julena Bingaman, Perfections Salon, Booty Parlors by Shannon Fink, Flocktails, Microderma Mitt, Parvali Designs with Stephanie McManama & Meredith Fancher. Music provided by KillerSpots.com. The Wise Owl will have drinks available for purchase, as well as complimentary hors d’oeuvres. Co-hosted by Cindy Berre ~ The Travel Authority and the Women’s Idea Network, LLC. In February, I told you about my friend Renie who got extensions after a bad haircut made her look a little too tragic for public consumption. Four months later, she’s now certifiably addicted to extensions. Before, she just got extensions in the front for an angled bob – just to give her a little length around the face. Now, she wants Rapunzel-rivaling long hair. I wasn’t sure about this. I remember I tried on Jessica Simpson clip-in extensions a year ago and I looked like a blonde hillbilly. But there was no talking Renie out of it. She wanted long hair. First, she had to get a straightening treatment for her real hair. She has a ton of curl naturally, so they needed that out so it could match the texture and curl of the extensions. Then they colored her real hair to match the extensions. Then they put in more than $1,000 worth of extensions (to give you an idea of how much hair they put in, each extension is $7). Then they did a “Balayage” treatment (hand painted highlights) to add a little dimension to the color and match the various colors of extensions they put in. Then they did a dry cut. The salon owner Kenneth said drycutting is important because it doesn’t split the ends of the hair. The extensions are only cut once (when you get them installed) so it’s important they aren’t damaged before you even walk out the door. This particular salon uses “DreamCatchers by Paris Hilton” extensions. With these, they put your real hair and the extension in a tiny cylinder together and then clamp it at your scalp. Then, when your hair grows out a little, they unclamp the cylinder, move it up and reclamp. That way, it doesn’t ruin your natural hair and you can keep the extensions in as long as you want (up to seven or eight months, after which they start to get a little wonky looking I hear). Watch the video below to see the transformation take place! I’m going to tell you a little story about my friend, Renie. She’s known as the chameleon of the crowd because she whimsically adapts and changes her look on a weekly if not daily basis. I’m not talking just going curly versus straight. She goes curly, straight, long, short, wig, red, blonde, brunette… and my personal favorite… the phony pony. Well, in the Fall last year she fell victim to a very very bad hair cut. Her bangs were literally little spikes, and it looked like a 4-year-old with scissors took to the back of her hair. It was baaaad. Hair has always been very important to Renie. So this devastated her. She’s been trying like heck to grow her hair back, but it’s been growing slower than molasses. Lately, she would either just wear hats, a wig, her phony pony (clip-on pony tail), or slick it all back. I could tell that none of these made her feel 100% and it was really affecting her self esteem. Well, about a month ago, I went to Perfections in Montgomery to a hair extension 101 event where people could learn about extensions, how they’re applied and maintained. I went to learn about it for me (I decided I would look best with short hair). But the whole time I kept thinking how perfect it would be for Renie! I suggested she get the extensions so she doesn’t have to wait for her hair to grow out to get her confidence back. So, she went and checked it out, learned more about them and decided to get them. 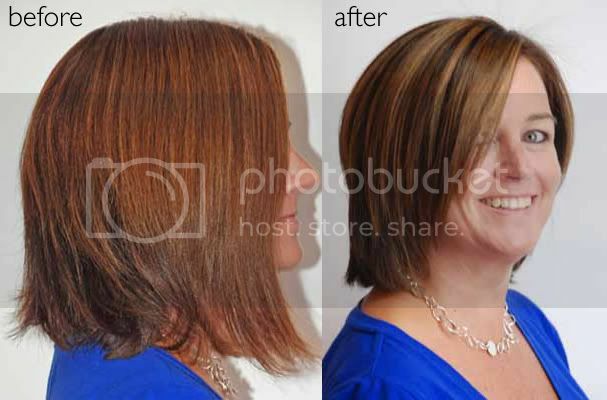 Angie, the stylist that applies the extensions, suggested that she do an angled bob cut so she gets a few extra inches in front to give her the length around the face she’s used to, but she doesn’t have to pay to have a full head of extensions put on. So, they put on about 50 strands (versus the 100 they would put on someone who wanted a full head of extensions). After they put in her extensions, it looked so funny – kind of like a reverse mullet. But Kenneth, the owner, is famous for his dry cutting. He quickly turned that mullet into one marvelous angled bob cut. He was going blow it out and straighten it, but Renie said she usually wets her hair, scrunches and goes to work, so he did that instead. The extensions are made of real hair from Europe and you can choose from curly, “beach wave,” or straight hair. Renie picked the beach wave so she can have the flexibility to straighten or scrunch without having to fight to make it work. These extensions will help give the allusion of longer hair until Renie grows her own hair to this length. Kenneth suggested a couple ways to help grow hair faster: Prenatal vitamins and massaging the scalp with dry hair every day. See the video below for a demonstration. The extensions were $11 per strand and she got 50 strands in. Plus, she got color and a glossing, and Kenneth’s dry cut is $65. This all ended up being about $700 total. And the maintenance, which she’ll need in about 5 weeks will be $120. But, as Renie said, it’s a small price to pay to get her confidence back. Renie said she is so glad she did it and loves her new hair. She said it looks and feels like real hair and she’s already gotten lots of compliments on her new look. People have no clue they’re extensions. She said next time when she goes in, she wants to get a few strands of blonde and maybe even a little purple for a streaking effect. No brushing your hair from scalp to tip. Because the hair is attached at the scalp, you could accidentally rip out your real hair and extension if you brush it like you would normal hair. What you need to do is hold your hair in a pony tail and brush the ends. No Redken products. Angie said there’s too much protein in this particular product and it will ruin the extensions. Don’t go to bed with wet hair. Angie said this is bad for your hair regardless of if you have extensions, but it’s especially bad for anyone with them. Check out the video below to see the entire process unfold from start to finish! Five short years ago, I was one hot mess. I had just graduated from college, so I was still used to $1 beers, all you can eat Skyline on Tuesday and $5 haircuts. Luckily, at the time, I was dating a guy who had a great sense of fashion and a talented hair stylist as a sister. He took me shopping and she took me to her salon. Well, my first hair cut/color with her was actually in a basement – like some covert mission to change my identity – but I emerged from that basement a new woman. I went to work the next day and got so many compliments. Friends and family raved. I would even get stopped by strangers asking me who cut my hair – some would even take pictures to give to their stylists. I’m not gonna lie. That felt really good. So, I abandoned my old salon (Sassy’s in Harrison… and the tragic cuts I got from there we’ve since coined as “Sassy ‘Dos.”) And now, I truly appreciate the power of a dynamic ‘do. With 2010 now upon us, I’ve been doing some research on new hair trends (I’m getting an itch for a new look soon), and I am noticing a resurgence of long hair. Long manes in the bouffant, braids or 20s-inspired barrel curls. As a short bob girl now, I’m starting to long for the long hair, but I don’t want to deal with the ugly “in between” phase. Plus, it can take a year or more to grow to long hair, so by then, the trend might already be on its way out. What’s a girl to do? My sister-in-law (a former Ben-Gal cheerleader) said a lot of the girls on the squad get extensions to have lots of locks to toss around on the field. I looked into it, and the salon that does all of the Ben-Gal’s hair and hair extensions, Perfections Salon, is having an event tonight from 6-8pm about hair extensions! It’s called “Dames, Drinks and DreamCatchers” (DreamCatchers are the brand of extensions they carry). A friend of mine and I are going! I’m really excited! They will have complimentary drinks and hors d’oeuvres, and are doing demonstrations on installation and care of the extensions. In the invite, it says they’ll install two free DreamCatcher extensions on all RSVPs (they can be expensive, so that’s a good deal!) You can still RSVP. 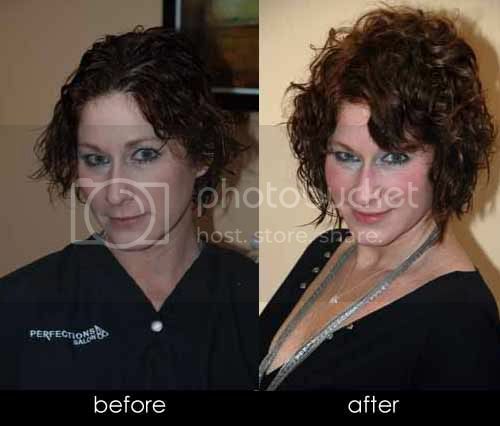 Just call Jill at (513) 984-2555.
Who knows… the next time I post… it might be with a whole new head of hair!